standards. Instead, non-operational (dead) meters are the primary concern for nonrevenue water. Opelika Utilities had no way of knowing how vast of a problem they had on their hands. For years, Opelika Utilities had employed a manual process to identify potential dead meters and extremely high/low monthly meter readings. An office team member would spend an entire day, once a month, reviewing the meter reports. Painstakingly reviewing the daily Microsoft Excel reports line-by-line of more than 14,000 readings. Due to this daunting manual process, there was a high probability of significant amounts of information being overlooked; including revenue loss. They needed an automated way to review meter readings, analyze, and, automatically generate work orders so that nonoperating meters could be attended to. In 2016, GISinc partnered with Opelika Utilities to connect GIS and Cityworks, with the billing system, utilizing backend processing scripts to develop a report of meter reading discrepancies. The scripting process was very intensive on the hosted servers and would take hours to complete. The effort proved to be a major improvement in process, which led to an estimated increase of annual revenue of over $100,000. 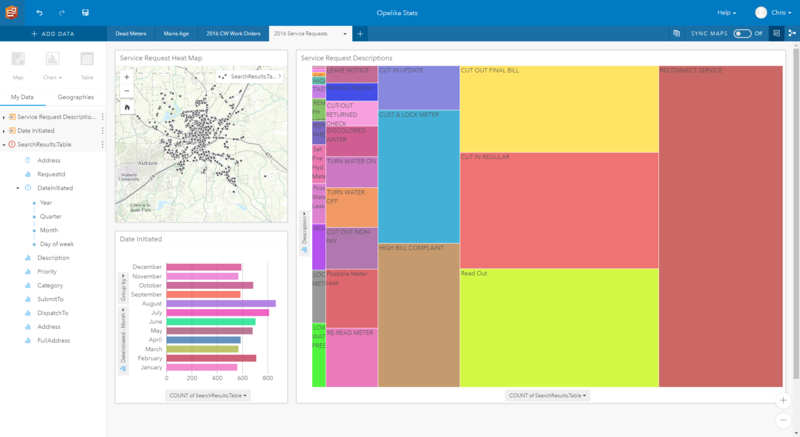 In April 2017, Opelika Utilities and GISinc traveled to Esri’s Philadelphia office to participate with the Esri water team in a Business Intelligence Summit. Armed with literally hundreds of thousands of records of data (service connection, meter usage and work order history, etc.) we could connect all the data to Insights for ArcGIS. The results were remarkably eye-opening to the point Opelika Utilities’ General Manager, Dan Hilyer, almost literally fell on the floor. Out of 14,000 meters, they were looking at results that were telling them over 20%, (3,000 ) were dead. “It’s information that no manager wants to hear, but information that we need to know”, said Hilyer. This translated into an estimated $25,000/month revenue loss ($300,000/year). The realization of it being higher than expected, Alan Lee, Opelika Utilities’ Capital Projects Manager, knew there was a larger problem. Using Insights for ArcGIS and further analysis, they could identify a trend of dead meters of a specific manufacturer, model number, and meters that were recently installed in new developments in their network. The good news was these meters were still under warranty, therefore, replacing the majority of the dead meters came at no expense to Opelika Utilities. “Insights for ArcGIS gives end user the power to filter data and see results without the requirement of being a computer programmer or python scripter”, says Alan Lee. “Once the data is connected, it’s all plug and play. A very powerful software”. 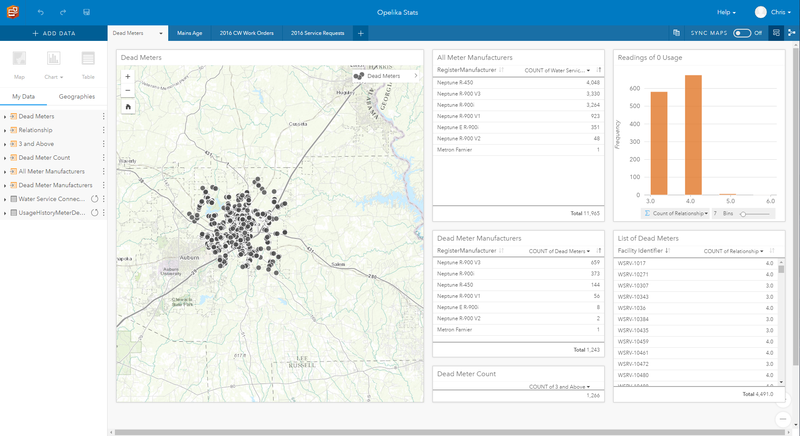 Some of the next steps include GISinc working with Opelika Utilities to streamline the results to include visualization and integrations with Operations Dashboard, Collector, and Cityworks. 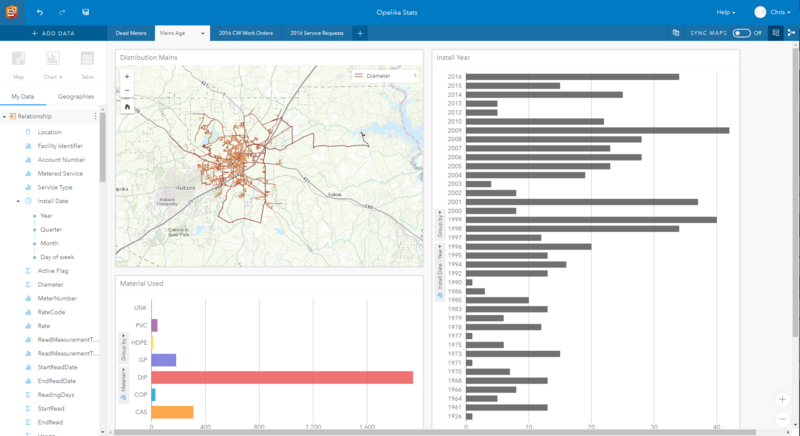 Additionally, Opelika Utilities is identifying the next big question and data to push through Insights for ArcGIS; as this analysis is just the beginning. “This is another example in the long line of value-add, return on investment examples Opelika Utilities have stood up over the years”, says Kevin Stewart, Director of Sales at GISinc. “They illustrate what can happen when you combine powerful technology from Esri with the desire to improve operational efficiency and a vision of location-enabled business. This exemplifies why they were also a 2017 Esri Special Achievement in GIS award recipient at this year’s Esri UC. Congratulations, and well deserved”! This project reminds us a simple truth about meters. All meters will die. This could be a result of manufacturer defect, age, or damage. At some point, every meter will stop working and require maintenance or replacement. The power of connecting your meter usage with service requests can help your organization identify the extent of your dead meter problem. This is a repeatable process and solution every water utility in America should employ. The Esri water team and GISinc are here to help and are collaborating on a solution/ service bundle for dead meter identification. Stop the revenue loss today!